Vice-President (Culture & Mayworks) of the Halifax-Dartmouth & District Labour Council Sébastien Labelle weighs in on the potential threat to our local film industry. Sébastien is a member of Solidarity Halifax. The NS Liberal government seems determined to pursue its trend of broken promises and reckless austerity policies. Already, Nova Scotians had been bracing for the privatization of more public services, including home care services and public document management services. Added to this has been the continued starving of both our P-12 and post-secondary education systems despite electoral promises otherwise. Now comes the news that the local film industry and the service sector industries that it supports can also expect to take a serious hit. In comments made last week to the Halifax Chamber of Commerce, Minister of Finance Diana Whalen suggested the coming provincial budget could include the elimination of the film tax credit program. This news came as a surprise as – in a fashion similar to what led to the health care restructuring debacle – the Liberals have failed to consult key people when determining their policies. Namely, those who work in the affected industry or economic sector. 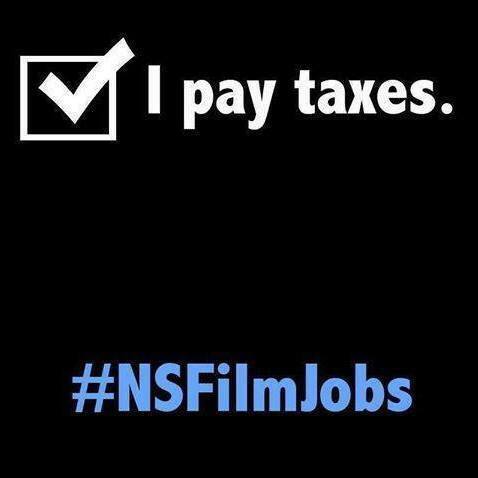 This lack of consultation is made apparent by both the justified outcry of those who work in the film industry, and also by the misleading inaccuracies of Minister Whalen’s comments when describing the film tax credit program. In her comments, Minister Whalen stated that the tax credit program costs tax payers $24 million per year, when in fact, the program generates more than $139 million annually in economic activity. Through this activity, over 2,000 jobs are created attracting mostly young workers. What’s more, jobs directly related to the film industry have some of the highest levels of private sector unionization offering families security and benefits when most jobs in the private sector are becoming increasingly low paid and precarious. In comparison, the Royal Bank of Canada, one of the most profitable corporations in the country, recently received $22 million from the Liberal government and is expected to create up to 500 jobs over 10 years. What this reveals are the typical fallacies of austerity policies where belt tightening rhetoric is paired with corporate welfare for the rich and where investment in the arts and culture is seen as a lavish expense rather than as essential to the vibrancy of our society. It is high time the NS Liberals paid serious attention to the needs of working Nova Scotians and the health of our provincial economy. The Halifax-Dartmouth & District Labour Council represents over 25,000 workers in the Halifax region, including thousands of members of the Alliance of Canadian Cinema, Television and Radio Artists (ACTRA), the Unifor Canadian Freelance Union, and the International Alliance of Theatrical Stage Employees (IATSE). The Labour Council also represents thousands of workers in the service sector industries that benefit from a thriving cultural industry.